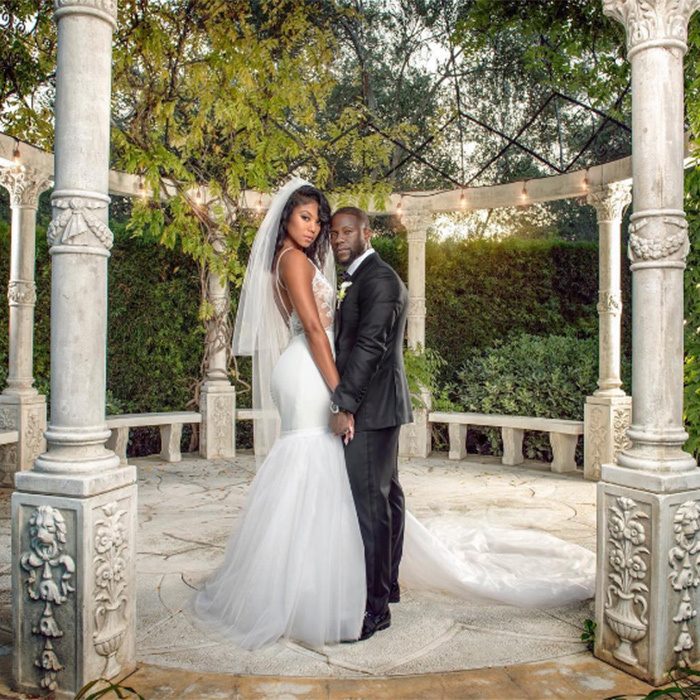 A new year has arrived and with it, lots of new wedding ideas! 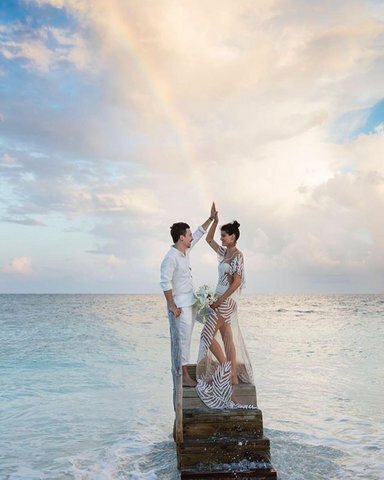 We have collected some predictions from the pros so you can create your perfect wedding style. Say goodbye 2017…the new year is coming in with a bang! We started seeing this trend emerge last fall, but it’s really going to shine in 2018! Not only do hanging flowers provide a fantastic visual element to your decor, but they’re practical too. Instead of cluttering your table with garlands, they allow space for more important things like beautiful dinnerware and champagne. These arrangements look amazing if they’re kept a bit wild with hanging vines and a variety of brightly colored blooms. 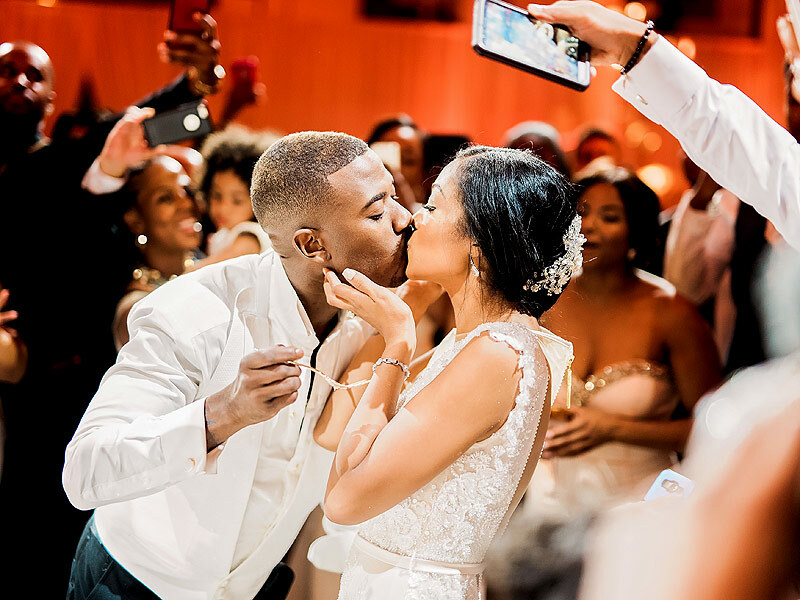 Couples are leaning more towards the formal side of things this year, says wedding planner Nora Sheils of Bridal Bliss in the Pacific Northwest. This means rustic and casual decor is making room for tall flower centerpieces with lots of drama. 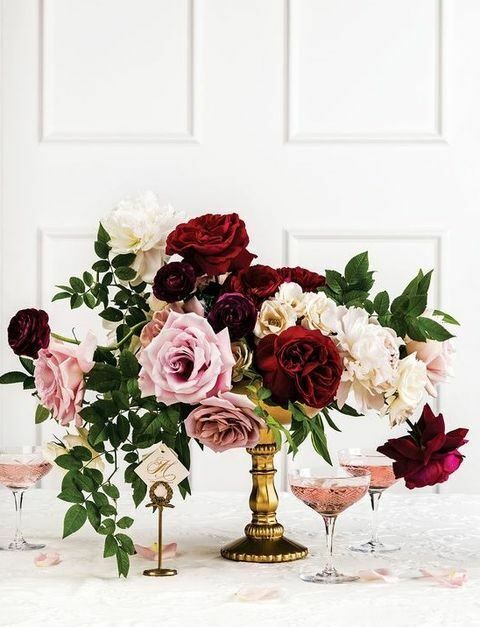 Gone are the days of understated mason jar arrangements, brides want glamour with luxurious blooms in bold colors- don’t be shy! When thinking about your florals, don’t forget about what you will be displaying them in. The vases add character to your arrangement so be creative! Brides are using vintage vases, colored glass, geometric shapes and even concrete to show of their style this year. 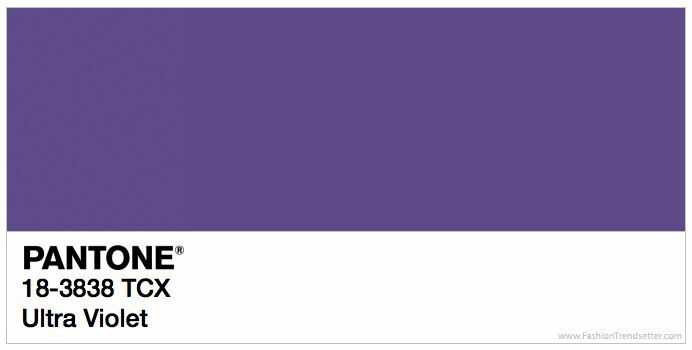 The new Pantone colour of the year is Ultra Violet, and it’s going to be everywhere in wedding decor! Described as “inventive and imaginative, lighting the way to what is yet to come” by Leatrice Eiseman, Executive DIrector of the Pantone Institute, this is a bold color. You can find most flower varieties in a similar shade such as purple mini carnations and dahlias. Move over greenery, there’s a new kid in town. Greenery will still be present in a big way this year, just revamped. 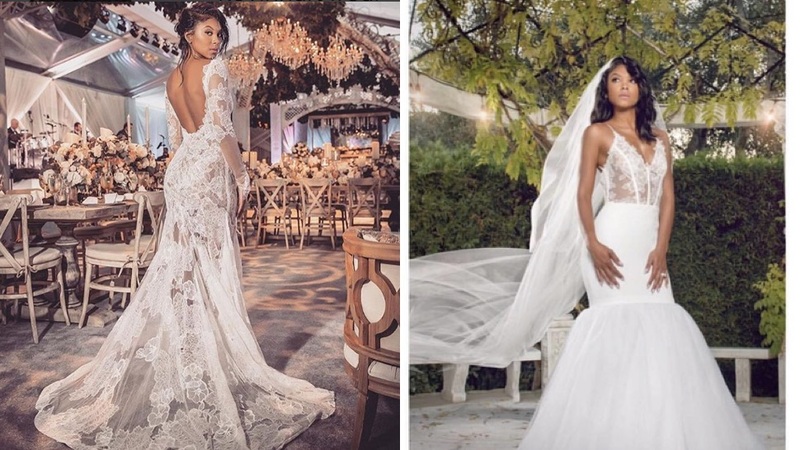 The trend is leaning more towards woodsy glam rather than rustic chic, says Taylor Green of Taylor Elise Events. Think wooden accents instead of burlap. 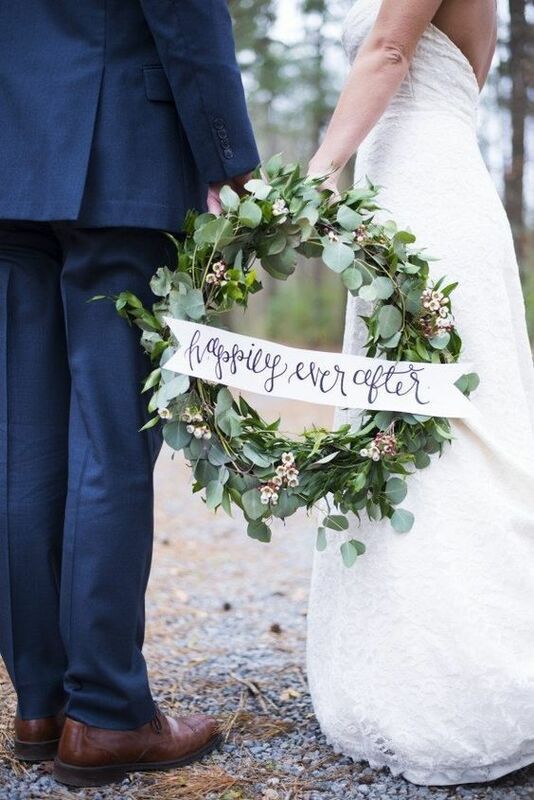 Bohemian brides are also loving wreaths made of Eucalyptus and wild flowers as an alternative to traditional flowers. So don’t worry, greenery isn’t going anywhere anytime soon! You can find beautiful bulk flowers to keep your own 2018 wedding right on trend, using online vendors such as BunchesDirect. Happy planning! If you are a Disney lover, now that you are all grown and ready to marry your own Prince Charming don’t miss these fabulous ideas for how to incorporate these fairy tale elements into your wedding flowers. 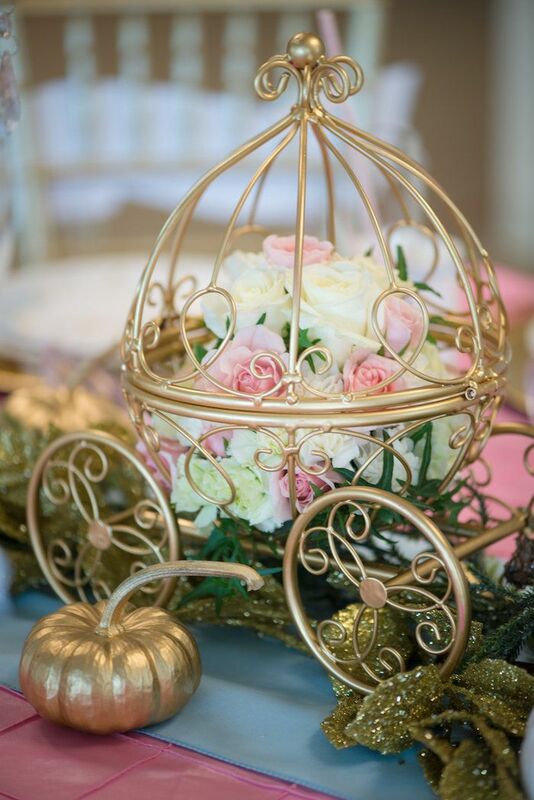 If you love Cinderella, source these sweet faux coaches for your table centerpieces. Select beautiful pink and white roses and delicate flowers such as pink alstroemeria or white hydrangeas to complement this look. 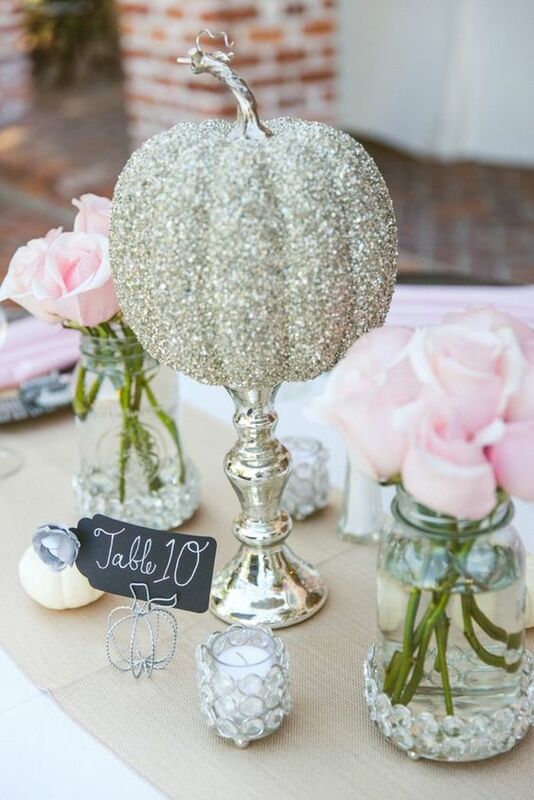 Source some sparkly pumpkins as a cute nod to Cinderella’s coach before it was transformed by magic, and complement the look with some lovely pink and white vases on either side. Sweet and simple! For your bouquets, consider continuing the pink and white Cinderella theme with some FairyTale or Pastel Sparkle Bouquets, or perhaps a Touch of Pink or a Subtle Beauty Centerpiece if you are less DIY inclined. 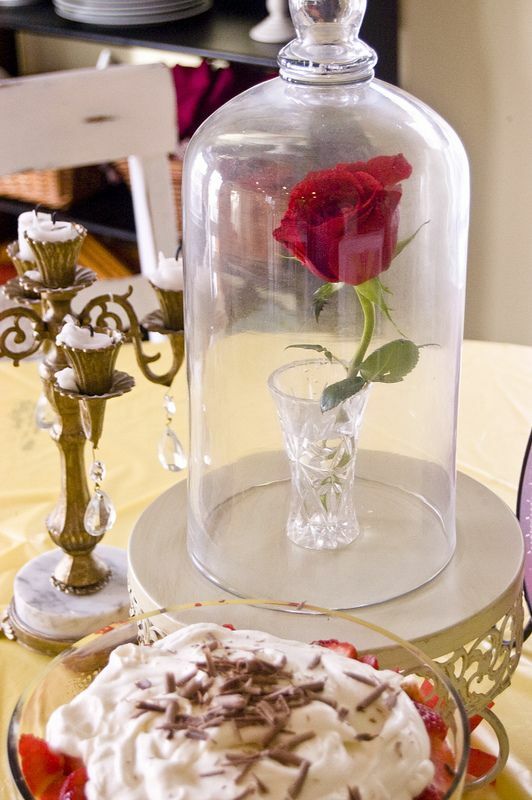 These beautiful “enchanted rose” centerpieces are actually so easy to make! Order fresh red roses (or any color you prefer) for low prices online and have them shipped to your door along with some clear glass cloches. Use a small crystal vase with water to hold the rose n place and keep it fresh. Simple and so charming! Continue the theme by using “Be Our Guest” on invitations or signs around the venue. 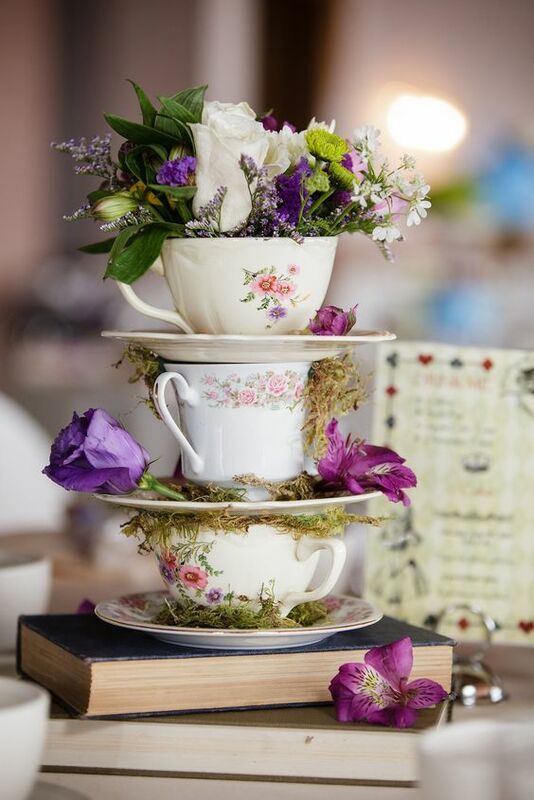 Consider these sweet teacup centerpieces and some books to represent Belle’s love of reading. In this case, the purple roses and purple alstroemeria add the perfect fairy tale touch. If old school Disney, with Minnie and Mickey Mouse is more your thing, then consider these cute Mickey centerpieces. These are also surprisingly easy to make. 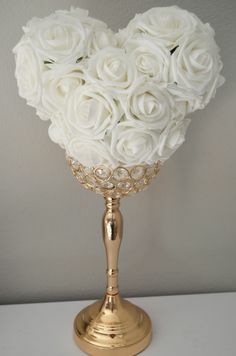 Use foam balls and a glue gun to create the shape, then use floral pins or floral adhesive to affix white roses, white carnations or whatever flower your heart fancies. 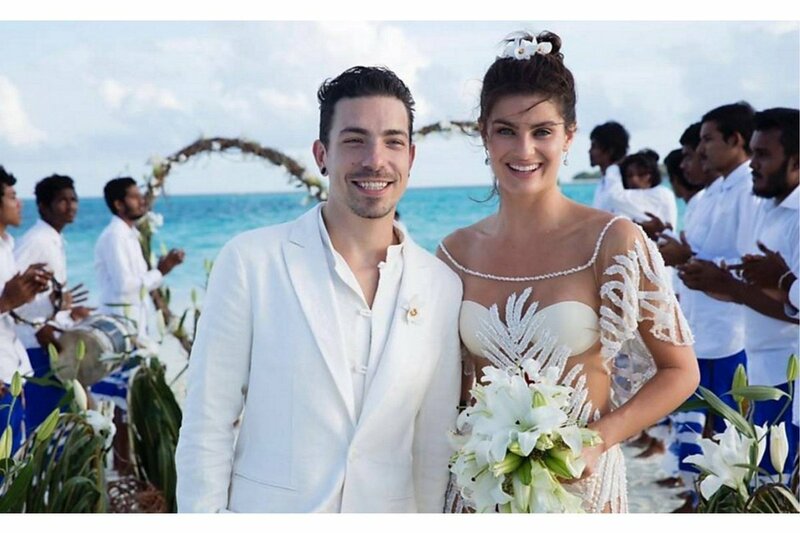 Wishing you a magical wedding, and all that your heart desires! Keep in mind that your guests will be occupying the tables for sometimes hours at a time. Avoid choosing centerpieces that are too tall and full, as guests won’t be able to see or converse with each other. If any of your guests have allergies or sensitivities to scents, you may want to avoid high fragrance or high pollen flower choices, such as lilies. (Your professional floral consultant will be able to guide you.) If the venue is dimly lit, you may want to consider adding tea lights or other candles to your centerpiece arrangements to boost guest lighting. 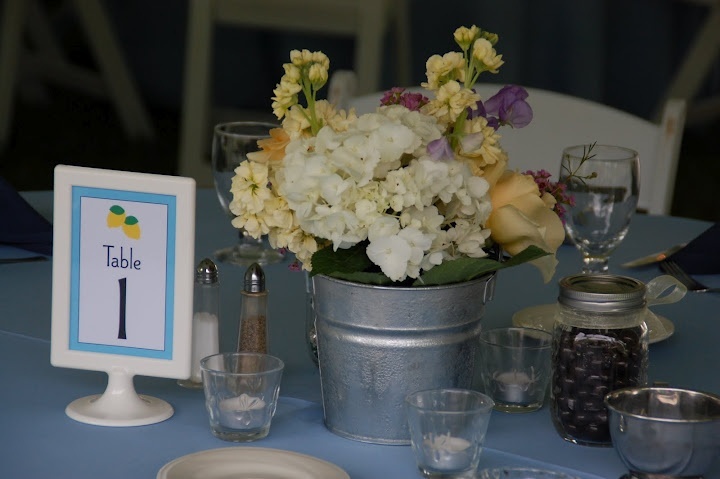 Consider the basic dimensions of your tables when choosing the perfect centerpieces. Round tables will look wonderful when highlighted with one centerpeice in the center, while rectangular tables will be well complemented by a series of centerpieces placed at regular intervals. Whatever the shape, make sure that your centerpiece suits the table size. A tiny centerpiece will look lost on a large round table that seats 12, while a very large centerpiece will overwhelm a small round that seats 4-6 and occupy too much of the available space to allow for glassware and comfortable dining. Keep the overall venue in mind in your centerpiece selection. 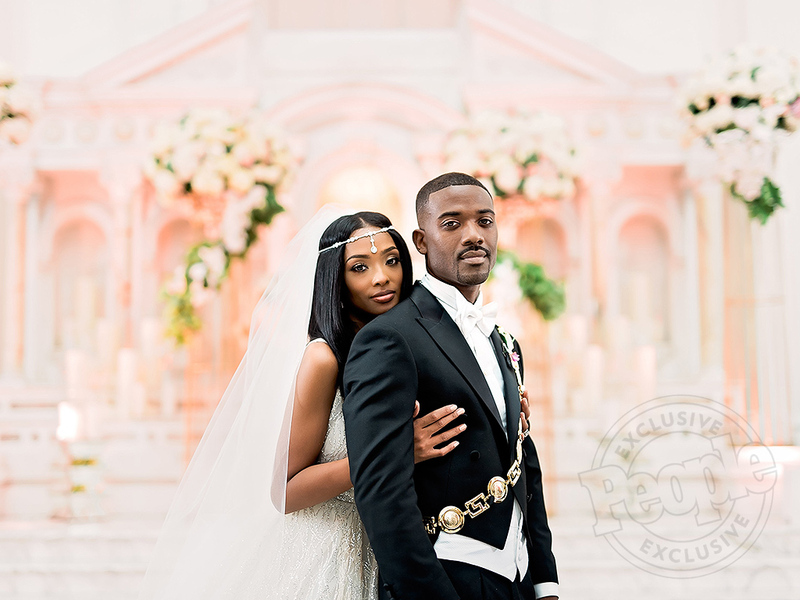 Is it a very formal and traditional hall, with lots of gold and glitter? In this case choosing a very rustic centerpiece, such as gerbera daisies, may look a bit out of place. Is it informal, modern, vivid, indoors, outdoors? All of these factors should be considered. If it is outdoors, for example, choose flowers that are a bit sturdier and can stand up to the elements more than a delicate choice might. You might also want to check with your venue to make sure that glass vases and candles are allowed as regulations may vary. Your centerpieces should definitely complement your chosen color palette and overall decor theme for the wedding or event. Select flowers and containers that will coordinate with or best complement your color palette, to create a pleasing final look for your tables and venue. If it’s a golden anniversary party, for example, consider flowers in creams and golds, such as bronze fuji spider mums with cream roses, in keeping with the theme. Baby showers usually are well complemented by pastels, while a rocking modern dance party might do well with more vivid flower choices, such as hot pink carnations mixed with bright green button mums in sleek black vases.Browse through photos to gather your ideas! Have fun with your centerpiece choices! You can definitely use them to express your own style and decorating flair. They will be a key way to add visual impact to your event. BunchesDirect provides you with many choices in pre-made centerpieces, along with friendly consultants to guide your decision making. Simply trim the stems to fit your container, and you have instant magic for your tables. Best of luck with your planning! Summer is the perfect time to celebrate and to host a special event with family and friends! Whether it’s a wedding, an anniversary, baby shower or beach party, BunchesDirect has you covered with some beautiful and well-priced centerpieces to make decorating your tables a snap. Check out these ready-to-go choices perfect for your summer celebration,with many more at the website. All centerpiece bouquets are assembled by our professional florists, with farm-fresh flowers. They come ready to be trimmed to fit your favorite container or vase. Presto: instant summer magic! Elegant white alstroemeria are paired with stunning light pink roses in this low lying arrangement. Another plus: these blooms have a sweet scent that will create a wonderful atmosphere for your special summer event. 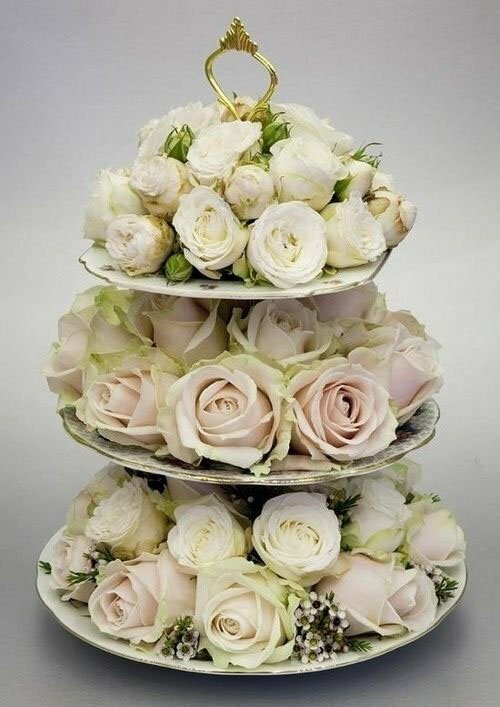 This would be a lovely choice for a bridal or baby shower, as well as a more traditional wedding reception. This beautiful new centerpiece features a lovely mix of pink, lavender and purple shades, with a pop of yellow for contrast. Carnations, orchids and chrysanthemum daisies are complimented with yellow lilies for a vibrant and modern appearance. This would work well for any summer event! Choose a vibrant mix of summer blooms for the perfect way to brighten and add energy to any event or venue. These bright colors are perfect for a beach wedding, a summer party, or even a festive anniversary celebration. This gorgeous assortment fits in beautifully in virtually any setting. An array of different flowers such as white roses, whtie asiatic lilies, white spray roses, iris, green button mums and wax flowers will provide a bold, modern look to your event tables. What an exotic and vibrant look for your special day. Our Fantasia Centerpiece features a colorful mix of orange roses and lilies, pink and yellow asltroemeria and hot pink spray roses. The centerpiece is further adorned by greenery and green hypernicum berries. This would be stunning at a beach wedding or a family barbecue party! Absolutely stunning, and so affordable! This is a perfect choice for a summer wedding or a baby or bridal shower. Features a brilliant mix of Chrysanthemums, Roses and Hydrangea, backed by two types of greenery. This beautiful centerpiece arrangement is a lovely addition to any summer occasion. It features a vibrant assortment such as roses, alstroemeria, dianthus, solidago (goldenrod), and leather leaf greenery. It would be a fantastic choice for a picnic, outdoor party, summer wedding or a anniversary where something elegant and yet not to formal is desired. Have fun at your special summer event! All centerpieces can be all custom made upon request.